Gilad Atzmon, an anti-Semite whose record and activity has previously been reported on this blog here and here, is currently touring the United States to promote his new book, “The Wandering Who?” The book is an exploration of Jewish identity politics (a topic frequently used by Atzmon to promote his anti-Semitic views) and the “tribal” aspects of Jewish discourse. 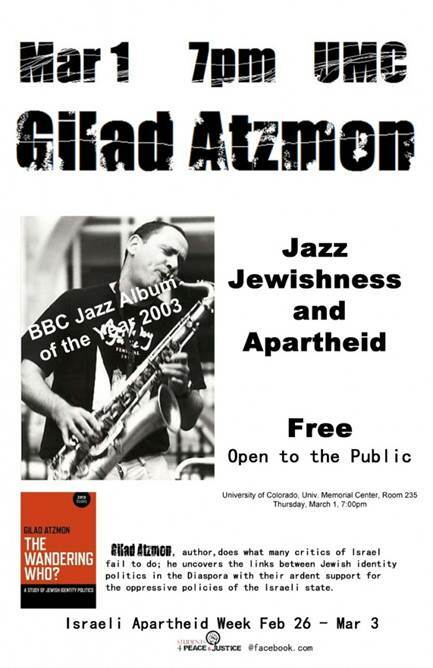 Following his first tour-related appearance in the U.S., a visit to the Islamic Cultural Center in downtown Oakland last Saturday, Atzmon is scheduled to stop in seven states and the District of Columbia between now and March 16.Some of Atzmon’s appearances will take place on university campuses, including the University of La Verne in California, University of Colorado, Boulder (which is an Israeli Apartheid Weekevent) and the University of Wisconsin, Madison. A fourth campus stop at Northeastern Illinois University is being sponsored by several university departments.